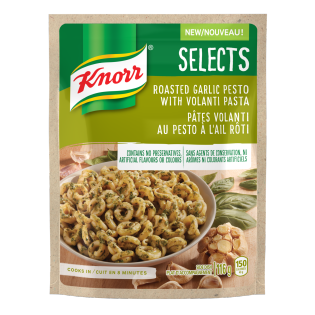 Wheat Volanti Pasta, Dried Vegetables (Garlic, Spinach, Onion), Parmesan and Romano Cheeses (Dehydrated), Salt, Corn Starch, Herbs, Olive Oil, Yeast Extract, Natural Flavour (Soy), Sodium. 1. Put 1 3/4 cups water and 1 Tbsp. olive oil into a medium saucepan and bring to a boil. 2. Pour your Knorr SelectsTM into the saucepan. Give it a stir. Bring to a full boil, then lower the heat to medium-high and boil 8 minutes, stirring frequently. 3. Turn off the heat and wait 2 minutes for the sauce to thicken. Stir once more and enjoy!